Carly and I meal plan every week, typically on Thursday night since she can go to the grocery store on Friday. We use an app called Our Groceries that lets you have multiple lists (of anything really). We keep a list called Menu and add ideas we find throughout the week. We also do our best to evaluate what we have and use up fresh ingredients and make good use of our pantry. One combination we come back to often is Brussels sprouts and sweet potatoes. We have it in a variety of ways, and last night we made a great version that I wanted to share. This salad has four main components that can essentially be prepared separately. First, cook the peeled & cubed sweet potatoes however you prefer. You can roast them in the oven or fry them in a pan. Season them with salt & pepper. Next, prep the Brussels sprouts. You can shred them in a food processor, on a mandoline or by hand. To do it by hand, chop the bottom off the sprout and discard any outer leaves that fall off when you do so. Cut the sprout in half. Lay it on the cut side and chop along the sprout from the top to bottom in slices. Also prep your sliced shallots (onions will work if you don't have them). Saute the shallots and sprouts in the oil of your choosing. We have some vegan bacon flavored grapeseed oil that we used for this. Season the sprouts with salt, pepper, garlic and smoked paprika. In a small pan, toast the chopped pecans for a few minutes until they start to turn darker. Remove from heat and use these as a topping. The pecans are optional, but added a depth of flavor to the salad that for me was the best part. This dish lends itself to a variety of protein sources. I happened to have a can of kidney beans and some tamarind chutney. I threw them together in a pan just to get them warm. Carly had bacon on her salad. You could essentially use any legume, tofu, tempeh, seitan or meat of choice. Last is to cut your lettuce. 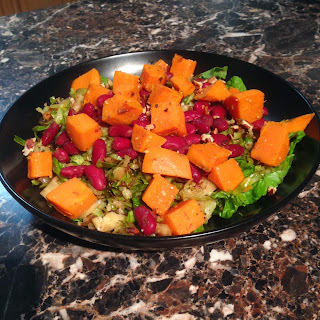 Assemble the salad: lettuce, drizzle of white balsamic vinegar, salt & pepper, sprouts, sweet potatoes, protein & pecans. More deliciousness to try! I'm having my enchilada shepherd's pie leftovers for lunch today. :) Thanks for sharing your awesome recipes!